GIL SCOTT-HERON-SMALL TALK AT 125TH AND LENNOX-VINYL EDITION. There’s been many an important day in Chicago’s musical past. That’s not surprising. The Windy City has given the world some of the biggest names in music. This includes Buddy Guy, Herbie Hancock, Nils Lofgren, Patti Smith, Ray Manzarek of The Doors and Pearl Jam’s Eddie Vedder were all born in Chicago. So was musician, novelist poet and political activist Gil Scott-Heron. Sadly, despite all he achieved, Gil Scott-Heron is to some extent, one of Chicago’s forgotten musical heroes. 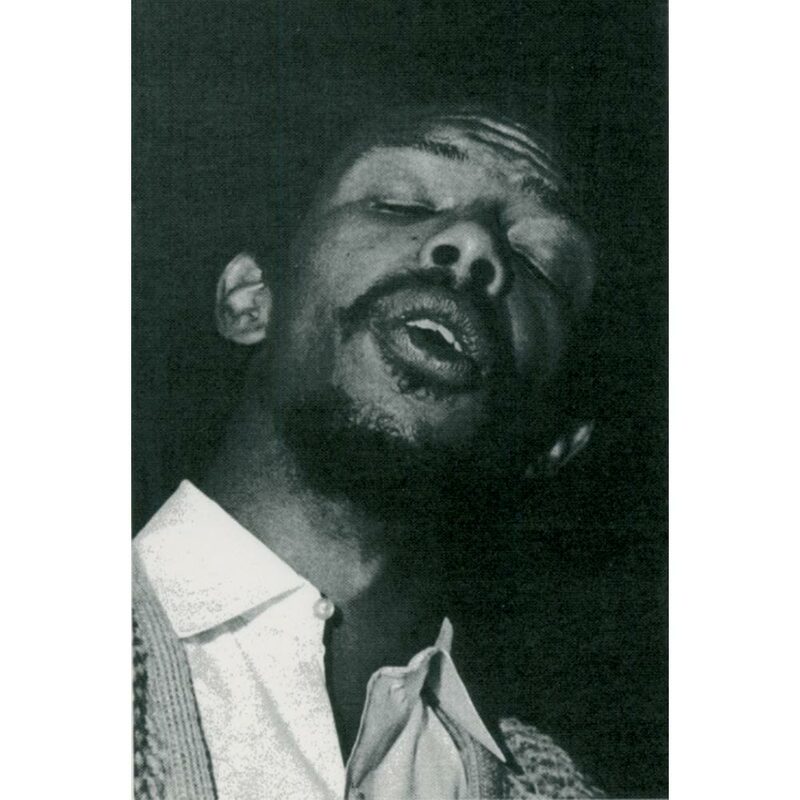 Gil Scott-Heron’s story began in 1949. April Fool’s Day in 1949 was an important day in Chicago’s musical history. That was the day Gil Scott-Heron was born. His mother Bobbie Scott-Heron was an opera singer. She sang with New York’s Oratorio Society. Gil’s father was Gil Heron was a Jamaican footballer, who at one time, played for Celtic Football Club. Sadly, Bobbie and Gil’s marriage ended when Gil was young. After this, Gil was sent to live with his maternal grandmother, Lillie Scott, who lived in Jackson,Tennessee. Then when Gil was just twelve, Lillie Scott died. Gil returned to New York to live with his mother. She was now living in the Bronx. Originally, Gil enrolled at the DeWitt Clinton High School, but later, moved to the Fieldston High School. This came after impressing the head of the English department. He’d read one of Gil’s essays and recommended that Gil received a full scholarship. This proved a poisoned chalice. The education he was receiving was better. However, he was only one of five black students. He felt alienated. Another problem was the socioeconomic gap. Other students came from a much more affluent background. Gil was the son of a single mother. It was at this period, that Gil became socially and politically aware. His eyes were opened to inequality, injustice and racism. This would shape his music in later years. Before that, Gil headed to university. Lincoln University was where Gil headed after high school. Gil was recommend to head to Lincoln University by Langston Hughes. He was also at Lincoln University and was a member of Gil’s first band, the Black and Blues. After two years at Lincoln University, Gil decided to take time out to write a novel. During this period, Gil Scott-Heron wrote two novels. His first novel was a thriller entitled The Vulture, was published in 1970. Whilst writing The Vulture, Gil saw The Last Poets in Lincoln in 1969. After watching The Last Poets, Gil approached the band and asked: “can I form a band like you guys?” The seed had been sown. Maybe, music rather than writing would be the direction Gil’s career headed? Having been impressed with The Last Poets and now considering a career in music, Gil had a lot on his mind as he headed back to New York. He found a new home in Chelsea, Manhattan. Once he’d settled in, Gil decided to make his dream a reality. So he looked for a record company. Gil just so happened to approach a label tailor-made for his music, Flying Dutchman Productions. After his departure from ABC/Impulse Bob Thiele decided to found his own label. Over the last few years, Bob had worked with some of the most innovative and creative musicians in the history of jazz. Bob realised that often, large record companies aren’t the best environment for innovative and creative musicians. Often, these musical mavericks didn’t thrive within such an orthodox environment. Their creativity is restricted, meaning they’re unable to experiment and innovate like they’d like. So when Bob parted company with Impulse, who he’d transformed into one of jazz’s pioneering labels, he founded Flying Dutchman Productions. This was the label that Gil Scott-Heron approached. There was a problem though. While Bob wanted to sign Gil, there was a problem, funding. The funding that Phillips, the Dutch record label had given Bob wasn’t going as far as he’d hoped. Despite this, when he met Gil he was impressed by the poet, musician, and author. So what Bob did, was fund an album that was a fusion of poetry accompanied by understated, percussive arrangements. 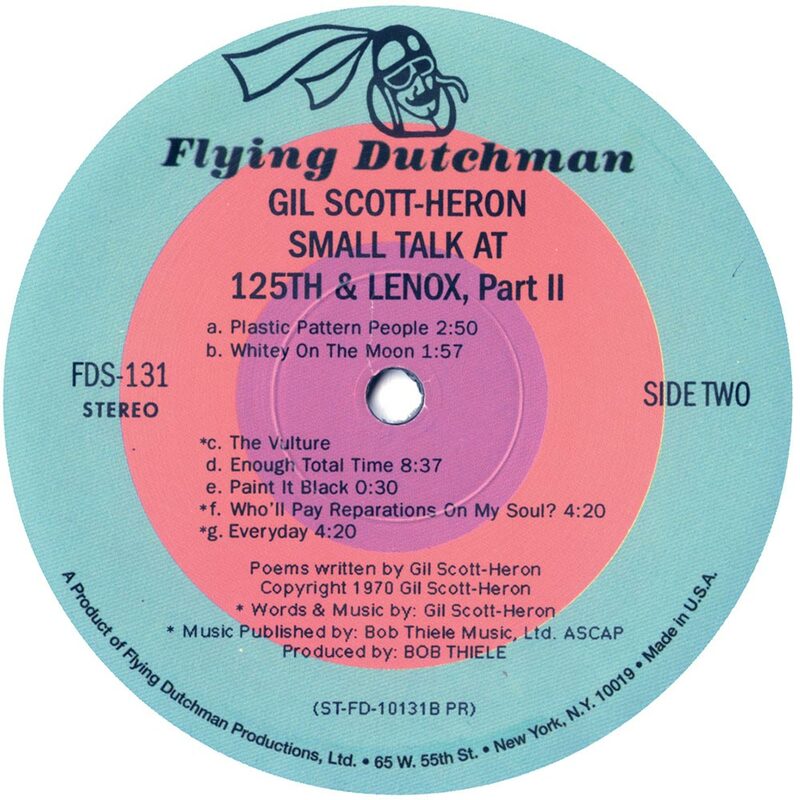 This was Small Talk At 125 and Lenox, which will be reissued on 180 gram vinyl on OST Recordings. 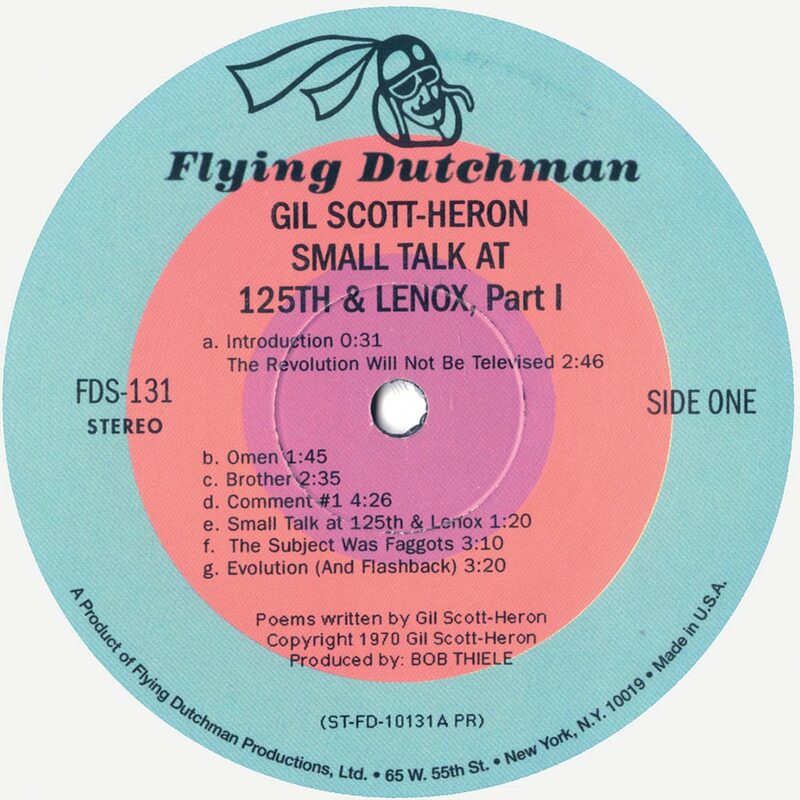 Recording of Small Talk At 125 and Lenox took place in the summer of 1970. Rather than record his debut album in a studio, Gil decided to record the album live. So, with percussionists David Barnes, Eddie Knowles and Charles Sanders accompanying him, Gil recorded fourteen tracks he had written. They became Small Talk At 125 and Lenox. 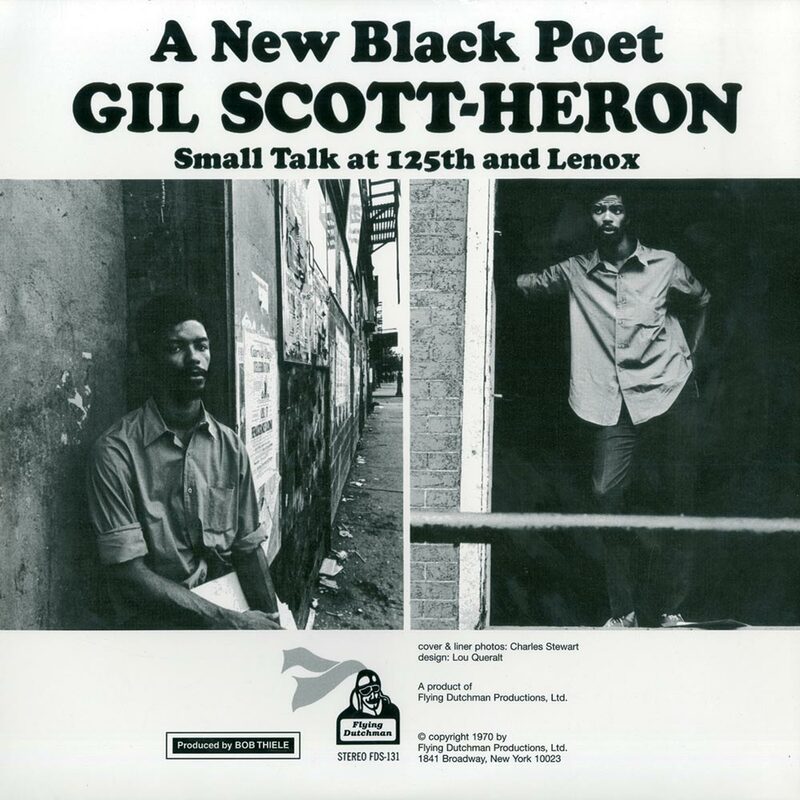 Prior to the release of Small Talk At 125 and Lenox, critics had their say on Gil Scott-Heron’s debut album. Straight away, comparisons were drawn with the group who’d inspired Gil, The Last Poets. To some extent, this was a fair comment. When one listens closely to tracks like Whitey On The Moon, plus what was the original version of The Revolution Will Not Be Televised, it’s apparent that Gil was taking what The Last Poets had been doing to the next level. With just a trio of percussionists accompanying Gil, Small Talk At 125th and Lenox was a potent and explosive mix of social comment and humour. Given that The Last Poets had enjoyed a degree of success, surely so should Gil? Sadly, when Small Talk At 125th and Lenox was released, it wasn’t a commercial success. However, a small crumb of comfort was, that The Revolution Will Not Be Televised found its way onto radio play lists. That was encouraging for Bob and Gil. The Revolution Will Not Be Televised introduced a wider audience to Gil Scott-Heron’s scathing take on politics, social comment and satire. This was first heard on Small Talk At 125th and Lenox. The first thing you realise, is that Small Talk At 125th and Lenox is quite unlike most of the music being released in 1971. The nearest comparison is The Last Poets. However, Gil took what The Last Poets were dong as a starting point, and took it much further. The result, Small Talk At 125th and Lenox is a potent, powerful and explosive mix of social and political comment. It’s a reflection of where America was, socially and politically. Racism still blighted America. Gil took this personally. It was like a personal affront. He felt obliged to speak up for those without a voice. 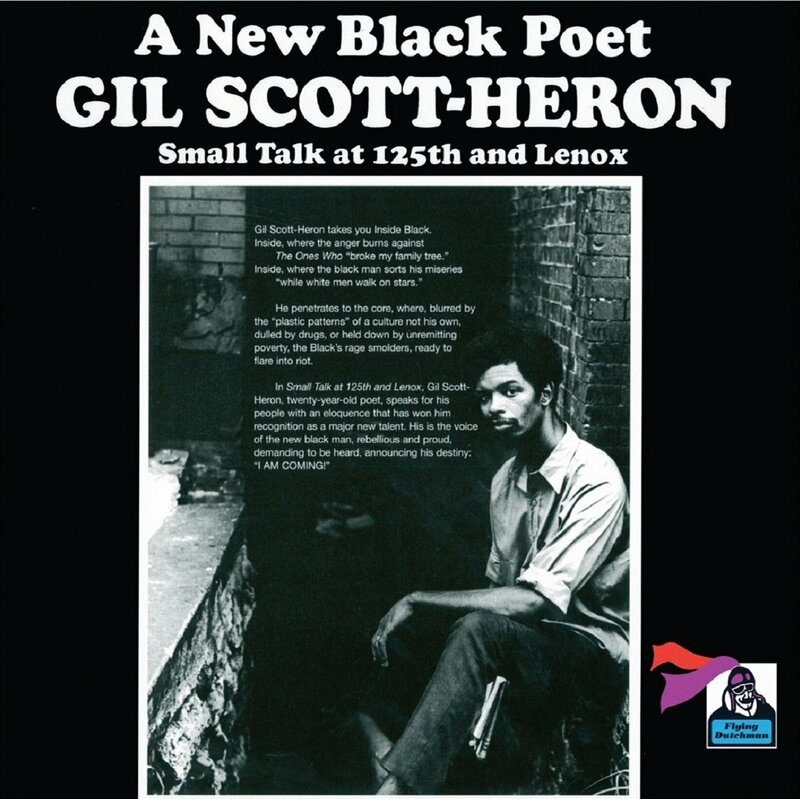 On Small Talk At 125th and Lenox, Gil Scott-Heron also rails and rages against corruption, hypocrisy, inequality, poverty and racism. Gil Scott-Heron a long-term political activist and advocate for change warns against inactivity. He longs for change, and is determined to make America a better country. His manifesto for change was Small Talk At 125th and Lenox. After introducing his band, fittingly, Gil Scott-Heron begins his set with the song that would become synonymous with him, The Revolution Will Not Be Televised. Accompanied by just bongos and congas, Gil delivers his unmistakable proto rap. His delivery is impassioned, as he encourages the audience to make a difference. Change won’t happen if they’re at home sitting on their sofas watching television. Instead, they’ve got to go out there and make it happen. Having set the tone for the evening, Gil Scott-Heron goes on to combine satire and passion. Racism, poverty, corruption and inequality inspire Gil. So does hypocrisy on Brothers, The Rainbow Conspiracy on Comment #1 and the money spent on the space race on Whitey On The Moon. Gil rages against money spent on the space race, while deprivation is rife within housing projects. Gil’s anger and disgust is apparent. His delivery is inspired and impassioned. Just like other tracks on Small Talk At 125th and Lenox, Gil delivers the lyrics as if they’re a personal affront. That’s the case on Evolution (and Flashback) and Enough. Both tracks see Gil examine the progress of black America since slavery. On Evolution (and Flashback), anger and frustration fills his voice as he delivers the lyrics. Later, as he mentions the arrival of Dr. Martin Luther King, there’s a sense of in Gil’s voice. It doesn’t last though. It’s as if the dream has died. especially when Gil ruefully says: “the bitter truth lives on.” Then on Plastic Pattern People compares life in the Northern and Southern states of America. Inequality and racism were rife in the South in the late sixties and early seventies. Again, Gil sees this as a personal affront. He rails against inequality, racism and injustice, as he provides a voice for the poor and oppressed. However, on a couple of tracks, Gil Scott-Heron draws inspiration from daily life. Like all good poets, Gil finds inspiration in everything and anything. An example is Omen. He was found inspiration for Omen in the New York subway, when he saw a painting publicising Kinji Fukasaku’s film The Green Slime. Then on Small Talk at 125th and Lenox, Gil found inspiration on the street corner. It’s as if he’s been eavesdropping on everyday conversations. He recounts what people were saying, right down to what they had for lunch. Then on a trio of tracks, Gil the poet becomes Gil the vocalist. On The Vulture, Who’ll Pay Reparations on My Soul? and Everyday, which closes Small Talk At 125th and Lenox sits down at the piano and sings. With just the trio of percussionists accompanying him, Gil is transformed. He proves to be a talented and soulful vocalist. Especially on Who’ll Pay Reparations on My Soul?, which takes a diversion in the direction of jazz. Everyday proves the perfect way to close Small Talk At 125th and Lenox. Especially with gospel tinged harmonies and handclaps accompany Gil’s heartfelt, soulful vocal. Throughout a fourteen album career, Gil Scott-Heron provided a voice for the disenfranchised. Fearlessly, Gil highlights the social and political problems that blighted America. He encouraged Americans to join together and change America for the better. This pioneering poet and protest singer made a difference politically. Gil made people aware of the problems people were facing and urged them to take action. His career began with Small Talk At 125th and Lenox, which introduced the world to Gil Scott-Heron, novelist, poet, political activist, singer and songwriter. For the next five decades, Gil Scott-Heron tried to make a difference with his music. His 1971 debut album, Small Talk At 125th and Lenox, is a mature and accomplished album. Gil combines power, passion, emotion, sadness, frustration, anger and confusion. In a way, his youthfulness helps Gil brings the lyrics to life. Gil was a young man and was aware of and possibly, had experienced the inequality and injustice he sings about. Gil rails and rages against corruption, hypocrisy, inequality, poverty and racism. Gil Scott-Heron a long-term political activist and advocate for change warns against inactivity. He longs for change, and is determined to make America a better country. His manifesto for change was Small Talk At 125th and Lenox. This potent, powerful and explosive mix of social and political comment was a reflection of where America was, socially and politically. Racism still blighted America. Gil took this personally. It was like a personal affront. He felt obliged to speak up for those without a voice on Small Talk At 125th and Lenox which will be reissued on 180 gram vinyl on OST Recordings.